Get to know the newest features on our website! Review the topics below to discover the latest developments. Check out our new, easy-to-use and easy-to-find ink and toner search tools! Quickly order ink or toner right from the Product Finders menu or from the Printers shop pages. You can filter results for your printer device by ink or toner color(s). Then use the filters panel to reset your search and view all compatible products. Quickly access your account by selecting Log On at the top of our website. Use the Select Your Homepage dropdown for quick navigation to industry homepages. Stay informed on the latest technology topics, news, and products as you scroll through the page. Get CDW.ca On The Go! 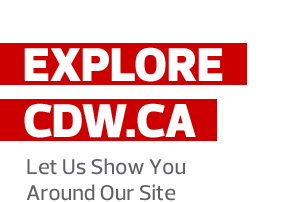 Our mobile-friendly website and iPhone and Android apps make CDW.ca accessible from anywhere! Browse, search, and order products. Look up product availability, tracking information, and recent orders. Save shopping carts and e-mail saved carts. Get started now! Access m.cdw.ca from your mobile browser or download our iPhone and Android apps today. NOTE: You must already have a CDW.ca account to place orders from a mobile device. Use our new multi-brand product finders to quickly search for compatible memory, replacement batteries and power adapters. Browse by device type, brand, product line and model number or search by keyword. We’re introducing three new ways to order! To replicate a previous order, click the new Reorder button on the Order Details page. Click the Reorder button on the Checkout Confirmation page to duplicate past orders. Quickly find previously purchased products by searching the new Recently Ordered Products page. Sort results by product name, order date, and number of times ordered. Shopping within a contract is easier than ever! Log into your account and select your desired contract from the All Product Catalog dropdown at the top of the website. If you already searched for a product, use the contract filter to the left of your search results to select a contract and refine your results. New search filters help you find what you want within your budget. View or print these handy tutorials highlighting our website features.